We are excited to announce the launch of the new custom website for Blazin Hydrographics, a local family-owned company specializing in high-quality, custom printing services. Located in Oregon City, Blazin Hydrographics uses a water transfer printing process, also known as hydrographics or hydro dipping, that is able to apply a custom graphic or pattern to nearly any waterproof material, including wood, plastic, metal, glass and more. The hydrographic process of printing is so aptly named for it involves physically dipping the material in water in order to apply the graphic or design. This makes it ideal for printing on three-dimensional surfaces, such as sporting equipment or car parts. 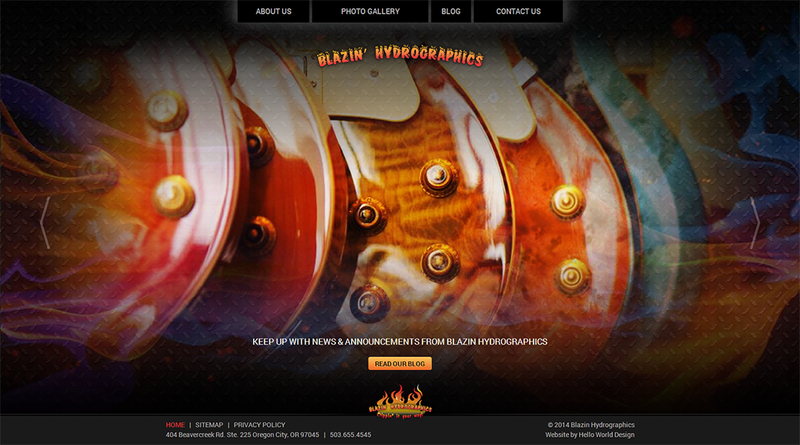 We created blazinhydrographics.com to be a fully responsive-adaptive website with special features for both the administrator and website visitors. Features include a touch-enabled slideshow on the homepage, gallery of Blazin Hydrographics' work, and a blog. Blazin Hydrographics is set to be the very first client to feature the latest version of our client admin, which is cross platform compatible, has drag and drop file upload capability and more! Visit the site and check out all the features and Blazin’ Hydrographics’ work for yourself.